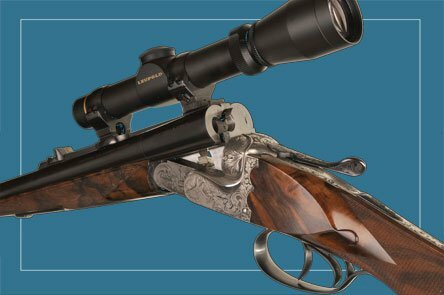 The hallmark of the fine, hand-crafted rifle or shotgun is the high quality not only of the finished firearm but of the raw materials and the individual components as well. 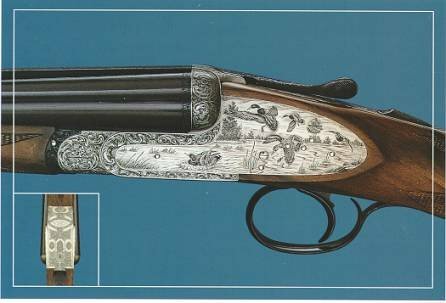 The firearms of Perugini - Visini prove the firm´s dedication to these essentials of the art of fine gunmaking: Devotion to the tradition of quality craftsmanship; Respect for the aesthetics of a firearm´s design and ornamentation; Felicity of handling; Willingness to learn from and improve on the past. 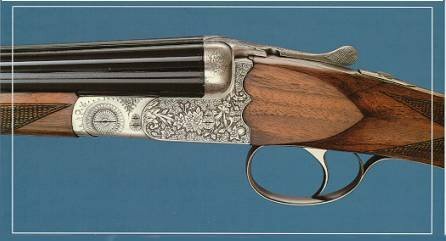 Messrs.Perugini and Visini founded their Atelier of Arms in 1968 to create guns for the most demanding shooters or hunter. 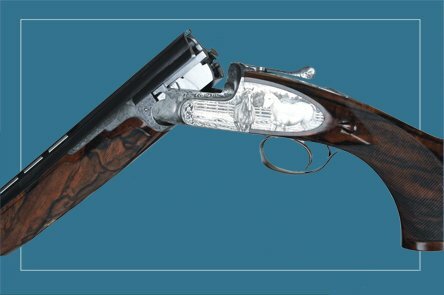 Perugini and Visini keeps alive the pleasure and satisfation of shooting the gun that has been crafted especially to meet the owner´s unique requirements. RECEIVER: Special steel; rigorously selected. BARRELS: Demibloc barrels; insides of barrels are fully chromed. EJECTORS: Automatic ejector with wide ejector / cartridge contact surface. FINISHING: Fine signed engraving, hinged front trigger. STOCK: Straight English type; European select walnut; fine hand-checkering. CALIBERS: 12, 16 and 20 (2 3/4" - 3"). OPTIONAL FEATURES: Extra set of barrels; choice of barrel length and choke; single trigger; stock with special features; special engravings. Available also as matched pair of side-by-side shotguns. All our barrels and receivers are given radiographic inspection for maximum reliability of materials. 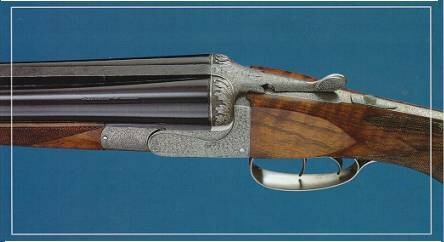 The Nova is a Best quality Boss inspired back action sidelock over and under smoothbore. The beautifully scalloped receiver is graced by pinless lockplates and adorned by engravings of the customers choice. Barrels are of the demi-bloc design coupled with a Boss styled forend and sideribs including a plunger release. The Nova is supplied with a hand made fitted custom leather case and all accessories. Truly a custom Best built at the distrection of the client. ACTION: Magnum Perugini & Visini. BARRELS: Böhler steel. TRIGGER: Single trigger with adjustable release/adjustable set trigger. MAGAZINE: Classic, 3-5 shot; button relaise magazine floor plate. SAFETY: Sliding tang safety (sliding tang safety and rotary wing type safety built into bolt sleeve for 98K). SIGHTS: Ramp mounted front sight with folding hood; folding leaf on rib (zeroed in at 50-100 m) / without sights and with base for scope mounting. STOCK: European select walnut; finely hand-checkered. FINISHING: Extra deep blued; checkered bolt knob and shaped bolt handle; pistol grip can house a spare front sight; hand - detachable sling swivels. CALIBERS: All current European and American calibers. OPTIONAL FEATURES: Dovetailed scope mounting with hook in base; stock with special features. All our barrels and receivers are given radiographic inspection for maximum reliability of materials. RECEIVER: Carved from a solid block of special steel. BARRELS: Böhler steel, demibloc barrels. LOCKING DEVICE: Double. 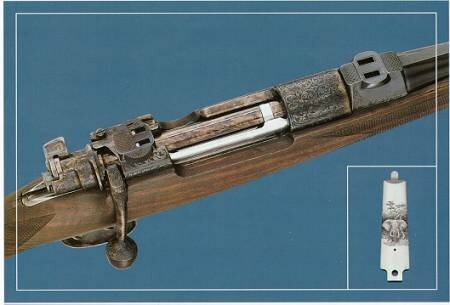 ACTION: H&H type, hand-detachable sidelocks; main spring fitted back to avoid weakening the receiver. EJECTORS: Automatic ejectors with wide ejector/cartridge contact surface. Special patented Perugini-Visini system for rimless cartridges. SIGHTS: Gold bead on matte ramp front, folding leaf rear (50-100 m) on rib. STOCK: High grade European select walnut briar, chosen for its strength and beauty of grain. FINISHING: Fine signed engraving; pistol grip can house a spare front sight; extra long receiver tang; oil finished walnut; English style heel-plate. CALIBERS: All calibers. 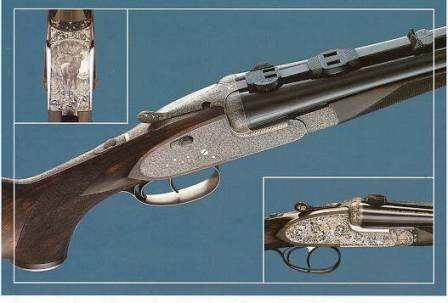 OPTIONAL FEATURES: set front trigger; automatic safety; shotgun barrels, cal.20 (2 3/4" - 3"); dovetailed scope mounting with hook-in base; special engravings; stock with spacial features. All our barrels and receivers are given radiographic inspection for maximum reliability of materials. RECEIVER: Carved from a solid block of special steel. BARRELS: Böhler steel, chapper-lump barrels. LOCKING DEVICE: Double. ACTION: A&D type. EJECTORS: Automatic ejectors with wide ejector/cartridge contact surface. Special patented Perugini-Visini system for rimless cartridges. SIGHTS: Bead on matte ramp front, folding leaf rear (50-100 m) on rib. STOCK: European select walnut. 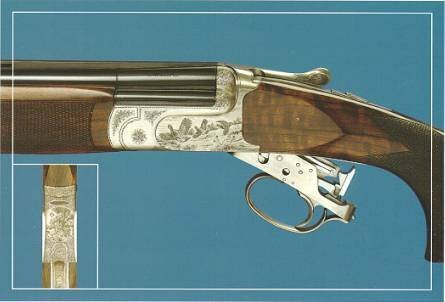 FINISHING: Finely engraved or with gold thread fitted around the color-cased receiver; oil finished walnut; English style hell-plate; inserted firing-pin carrier sleeve. CALIBERS: All calibers. OPTIONAL FEATURES: set front trigger; automatic safety; shotgun barrels, cal.20 (2 374" - 3"); dovetailed scope mounting with hook-in base; stock with special features. All our barrels and receivers are given radiographic inspection for maximum reliability of materials. RECEIVER: Carved from a solid block of special steel. BARRELS: Böhler steel; monobloc barrels. LOCKING DEVICE: Double. ACTION: A & D type. EJECTORS: automatic ejector with wide ejector/cartridge contact surface. Special patented Perugini-Visini system for rimless cartridges. SIGHTS: bead on mattle ramp front, folding leaf rear (50-100 m) on rib. STOCK: European select walnut. FINISHING: Finely engraved or with gold thread fitted around the color-cased receiver; oil finished walnut; English style heel-plate. CALIBERS: 7 X 65r, 30-06, 9,3 X 74r. OPTIONAL FEATURES: Set of trigger; automatic safety; shotgun barrels, cal.20 (2 374" - 3"); dovetailed scope mounting with hook-in base; stock with special features. All our barrels and receivers are given radiographic inspection for maximum reliability of materials.